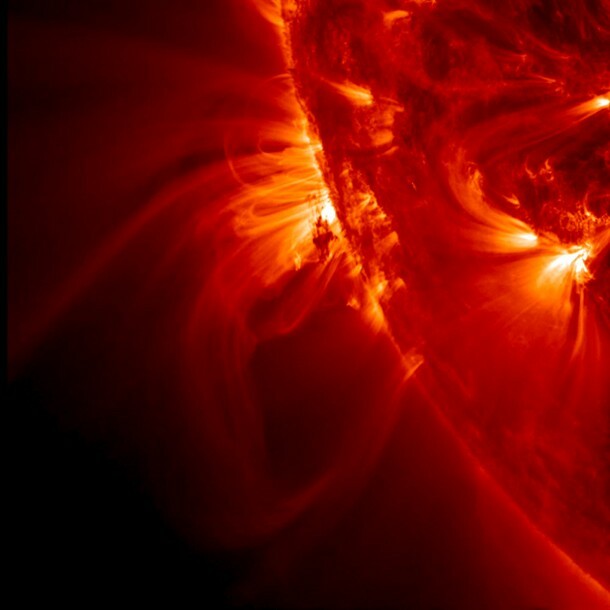 NASA’s Solar Dynamics Observatory (SDO) zoomed in almost to its maximum level to watch tight, bright loops and much longer, softer loops shift and sway above an active region on the sun, while a darker blob of plasma in their midst was pulled about every which way (May 13-14, 2014). The video clip covers just over a day beginning at 14:19 UT on May 13. The frames were taken in the 171-angstroms wavelength of extreme ultraviolet light, but colorized red, instead of its usual bronze tone. This type of dynamic activity continues almost non-stop on the sun as opposing magnetic forces tangle with each other.